I'm in a really strange position of having cleared a lot of "stuff" out of my life (not necessarily for ever) in order to calm things down a little, and yet still feeling I'm on a roller coaster, because the weeks are flying by and I'm barely keeping up with what's going on. Sadly I'm not making much headway on the music front, just can't find my way back into it, and we've been so so few gigs lately I've forgotten what's happening where! Also, I had to cancel two craft fair events due to stuff happening at home. So that's two things I really enjoy doing which seem to be very much on the back burner at the moment. I did finish this latest appliquéd blanket cushion cover, I love the colour scheme, the wool felt appliqué really "pops" against the deep blue blanket. 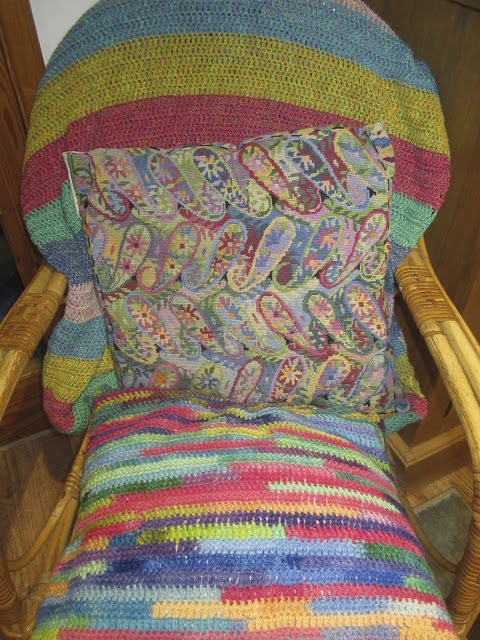 The header photo shows a cushion cover and a throw I crocheted to go over the back of my chair in the summer house going up in the garden. Speaking of which, here's a photo of the concrete base, waiting for the guys to build the rest of it. I can't wait to start putting in the things we've discovered on our tour of the junk shops, though some of them still have to be cleaned up and painted. I'll be sure to show you the results. On the baking front, I've been experimenting with sourdough again, and, armed with a starter gifted to me by a friend, I've made a couple over the past two weeks. They were quite tasty, though I didn't get the rise I'd hoped for. Since then I think I've managed to kill off the starter, unfortunately. Back to the garden, we've still got a few flowers hanging around, though they are mostly struggling to show their heads above the sea of fallen leaves. And in the plastic bins are some parsley and chard, rescued from my Square Foot Garden which has had to be re-sited because of the sumner house. In the space of half a dozen weeks, we have celebrated my birthday, Jim's birthday, and our 45th Wedding Anniversary. We're still amazed to be able to say that, it's a bit of a record these days, but we know how lucky we are to still have each other, because very sadly a good friend of ours recently died unexpectedly at home. It's taking a while for it to sink in to be honest; for a short guy Dave had a very big personality. Coming suddenly like that it certainly makes you pause and count your blessings. I hope you all have lots of wonderful things to find yourselves blessed with! Congratulations on your anniversary. Your right it seems to be rare these days to be married that long. We will celebrate our 39th anniversary in November. I've been experimenting with sour dough as well and just can't get that rise either, although is tastes fine. Just have to keep trying. Hi Ronnalyn, lovely to meet you; just checked out your blog - lovely! I like your style!! Yes, the sourdough is a 'work in progress' but at the moment I'm cutting back on carbs in my Quitting Sugar Campaign, but we are still eating well. (Loads of foodie posts in my archive, with lots of tempting pictures!) Look forward to reading more of your travels and recipes. Home life has to take priority but the crafting time, and music, will have its day again. I am still sewing like a thing possessed and loving every minute of it. I have made it my goal to work through as much fabric as possible by the spring as then have a juggle round of my equipment. I would love to go up a size in the grace frame, so many of the quilts in my head are too big for the one that I have. I am taking a "Bloggers day out" soon and want to get a beginners cross stitch to practice with. Sorry to hear about your friend Dave, never easy when it is someone very close. Congratulations though on your wedding anniversary, you must have been a child bride! I have never managed to successfully start or keep a sourdough:( I hope eventually you find your mojo, never easy sailing on life's ocean without a map! Hi Dc, yes, awfully sad, his wife Pat is a good Guiding friend of mine - actually she's the County Commissioner for Norfolk, so she has a lot of good friends and family for support but it is hard. As for child bride- I was 19! Young I guess but we grew up pretty quickly! The cushion cover is beautiful! I keep buying fabric with lots of ideas in mind but can't seem to get started. We had our 51st anniversary yesterday. Blows the mind :)...and I have a birthday 2 days after Christmas ....don't even want to think about that one. Things keep moving along and we have to hop on the band wagon, don't want to think of the alternative. Your mojo will return....just give yourself time....Bless you! Well, I am blessed with a husband with the patience of a saint, good friends, and interesting blogs to follow and be inspired by ... naming no names here you understand! And I know how you feel about the number you are not matching the number you feel... not an uncommon feeling I've discovered. I'm doing lots of felty stuff lately and loving it, just sad I can't find any blankety stuff like your blue one here on the cushion. I'm having to use felt as the backing as well as for stitching the shapes onto, and I'm sure it would be softer, easier too, if it were wool blanket. How's the quitting sugar going, and belated Happy Birthday too. Congratulations on your long marriage Lynne and hope you enjoy many more. I look forward to seeing your summer house! Meant to say how lovely you're getting a summerhouse - a consolation prize for not moving? Have fun with it, I'm just having a rethink about mine, having insulated it and put up lining paper, I am leaving it now until next spring before decorating it properly. Trouble is, I keep changing my mind as to how I want the finished look!! !